Provisionally numbered HA-201 and attached to Sasebo Naval District. Lt Sato Yoshikazu (70)(former torpedo officer of I-361) is appointed the Chief Equipping Officer (CEO). Sasebo. HA-201 is completed and registered in the IJN. Attached to Sasebo Naval District. Assigned to Captain Koizumi Kiichi's SubDiv 33, Kure Submarine Flotilla for working-up. Lt Sato Yoshikazu is the Commanding Officer. Reassigned to SubDiv 52 under Captain Yokota Minoru (former staff operations officer at SubRon 11). Continues working-up in Inland Sea. Reassigned to Japanese Submarine Division Three under LtCdr (later Captain) Paul R. Schratz with HA-202, HA-203, HA-205 and HA-210. Washington, DC. At a Submarine Officer's Conference, attended by former ComSubPac Vice Admiral Charles A. Lockwood, it is decided to dispose of all remaining captured Japanese submarines by sinking. Goto Islands. HA-201 is tied to the mammoth Sen-Toku I-402 aviation gasoline tanker submarine and used for target practice by USS EVERETT F. LARSON (DD-830) and GOODRICH (DD-831) after the rest of the former IJN boats are scuttled. At 1624 the two submarines go down 16 miles off Kinai Island on bearing 090 just beyond the 100-fathom line at 32-37N, 129-17E. 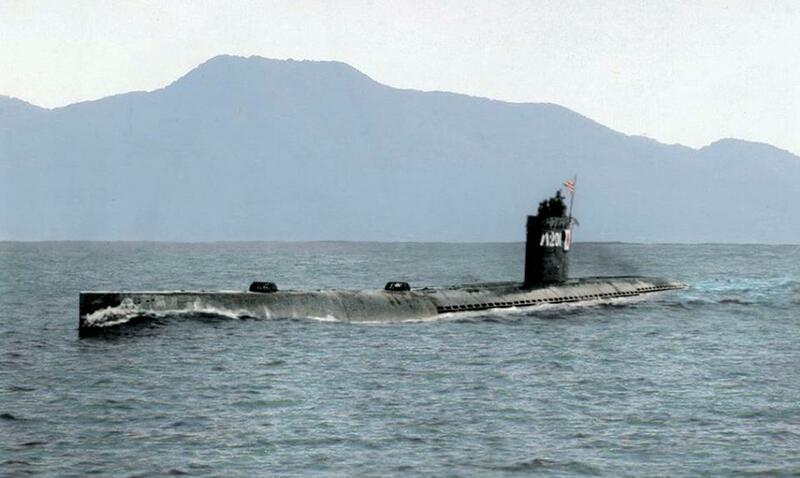 The HA-101 class were conceived as supply submarines. HA-201, on the other hand, was a high-speed attack craft, somewhat similar to the German Kriegsmarine's Type XXIII. Lt Sato's first name has several possible readings. Thanks go to Dr. Higuchi Tatsuhiro of Japan, Mr. Derek Waller of the UK and the fellow submarine enthusiast Steven Eckhardt of Australia.